Some people avoid home canning because they're afraid of botulism poisoning, but following the right guidelines will help you prevent foodborne illness. Botulism spores are everywhere – from the deep ocean to mountain tops. You're likely breathing them right now. It's only under specific conditions that they become dangerous. 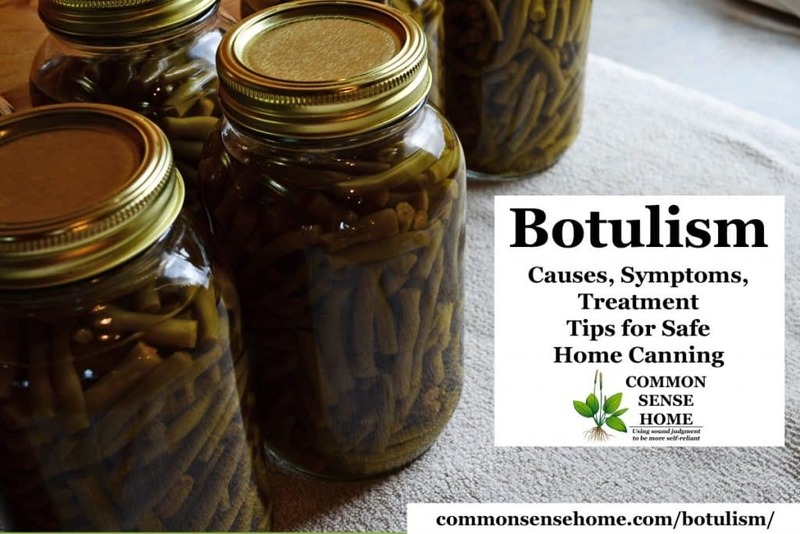 In this post we'll cover botulism causes, symptoms and treatment. You'll learn how to prevent botulism in home canned food so you can can safely. A sealed jar of moist, low acid food provides excellent conditions for the growth of botulism bacteria. If food is not processed correctly, it's possible for the toxins to build to dangerous levels within 3-4 days. Normally, botulism spores hang out and go right through your body without causing problems. They're tough critters. Hours of boiling, heat, cold, chemicals – they can survive them all. Problems show up when the spores germinate. When the spores become biologically active, they produce deadly neurotoxins. Out in the dirt, no big deal. There are plenty of other microbes to balance things out, and the toxins don't build up to high levels. Stored in your canning pantry – not good. Botulinum toxin can kill you. (This goes for the C. botulinum used in Botox® treatments, too.) If botulism symptoms are caught early, there is a botulism antitoxin that can prevent paralysis and death. How can I get botulism? Foodborne botulism is caused by the consumption of foods containing pre-formed botulinum toxin. Wound botulism is caused by toxin produced in a wound infected with Clostridium botulinum. 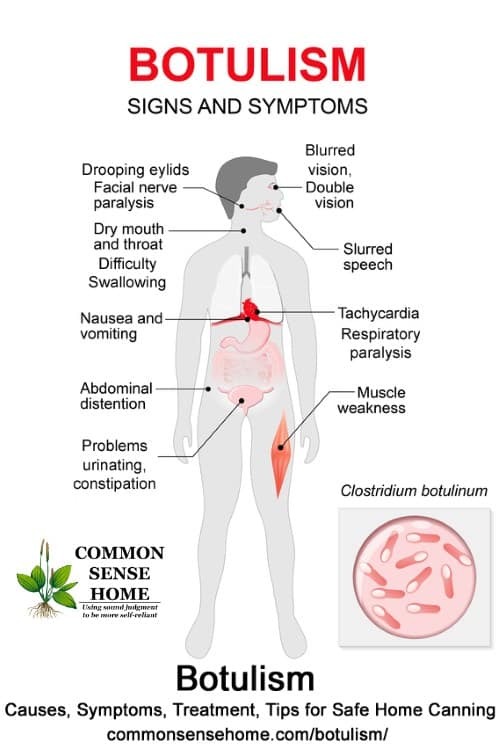 Infant botulism by definition occurs in persons less than one year of age and is caused by consumption of spores of C. botulinum, which then grow and release toxins in the intestines. “Other” botulism: Consistent with the Council of State and Territorial Epidemiologists (CSTE) position statements, the “other” category includes botulism in which the route of transmission is unknown. Cases are classified as “other” if the patient with confirmed botulism is not an infant, has no history of ingesting a suspect food, and has no wounds. The “other” category also includes iatrogenic botulism, which is caused by an accidental overdose of botulinum toxin (that is, a therapeutic or cosmetic injection), and adult intestinal colonization (adult intestinal toxemia) botulism, a rare kind of botulism that occurs among adults by the same route as infant botulism. Babies tend to pick up botulism spores because they crawl around on the ground where the spores are more abundant. It's also recommended that raw honey not be fed to infants under one year of age. A total of 199 confirmed and 14 probable cases of botulism were reported to CDC in 2015. Among confirmed cases, infant botulism accounted for 141 (71%) cases, foodborne botulism for 39 (20%) cases, wound botulism for 15 (8%) cases, and botulism of unknown or other transmission category for 4 (2%) cases. Among probable cases, foodborne botulism accounted for 6 (43%) cases and wound botulism for 8 (57%) cases. How do I know if canned goods have botulism toxin in them? You can't spread botulism person-to-person. The toxins must be ingested. One gentleman found out the hard way that canning shortcuts are not a good idea. Mike O'Connell “pressure canned” elk, but he cut the processing time and didn't follow correct canning practices. It nearly killed him. “Borrowed a pressure cooker, used an old family recipe for canning,” O’Connell said. I had way too much meat to deal with,” said O’Connell. “Which I remember as a child was the signal for you’ve lost the seal,” said O’Connell. “This time, it didn’t work out,” O’Connell said. O’Connell had an upset stomach in the night, but he didn’t connect it to having eaten the meat. He says growing up, he didn’t know anyone who got food poisoning from home canned foods. At the hospital, once doctors ruled out a stroke, O’Connell was sent home. But he was back in the hospital a few hours later. Now he was having difficulty swallowing. The next morning, Mother’s Day, O’Connell’s daughter, Kelly Weisfield, drove to Olympia to see her dad. “His voice was very slurred and his eyelids were droopy, but he was sitting up in bed and he was communicative,” Weisfield said. “By now, my eyes were closed. My strength—it was just amazing how quickly that went,” O’Connell said. His breathing was getting shallow. Daughter Weisfield was frustrated with the lack of answers and scared. She called a doctor she knew, a neurosurgeon. He ran through a short checklist of things to rule out. That list included a disease first identified in the 18th century: botulism. Weisfield looked it up online. “It just made the hair on the back of my neck stand up because it was every single symptom just laid out exactly what my dad was experiencing,” she said. Botulism is a paralyzing illness caused by what Centers for Disease Control calls the most potent toxin known to science. It’s rare; there were only 20 foodborne cases nationwide in 2011, just one in Washington state last year. Improperly home canned foods are the leading culprit, especially those low in acid like green beans and, yes, meats. Weisfield called her mom who had just left the hospital. “And I said, ‘Mom, turn around. You got to go back and tell them to look into this,’” Weisfield said. Weisfield was relieved, but also terrified that it was too late. Her father could hardly move now. He was having more and more difficulty breathing. The hospital had parked a ventilator outside his room. Weisfield didn’t know what to tell her 10-year-old son, who is very close to his grandfather. “First thing Connor said was, ‘Are we still going to go on our fishing trip?’ And I could never answer him, because I didn’t know,” she said. The doctors didn’t even wait to confirm botulism. They ordered a dose of anti-toxin from the CDC. Now the medical mystery was solved. But how did O’Connell get botulism? Remember he stopped cooking the jars of elk meat when he heard the seals lock in place. Washington State University food safety expert Zena Edwards says that was O’Connell’s nearly fatal mistake. “All that indicated was it had now become an anaerobic environment, an oxygen-free environment,” Edwards said. And that’s the strange thing about the bacteria that causes botulism. It thrives when deprived of oxygen. By shortcutting the cooking time, O’Connell failed to kill the bacteria. Instead, he sealed it into the perfect environment for it to produce the poisonous toxin. To prevent botulism poisoning, you need to avoid the conditions that cause the spores to germinate and/or kill off the spores. Kill botulism spores using a pressure canner and tested canning recipes. Spores are destroyed by heating food to 240-250°F/116-121°C under pressure of 10-15 pounds per square inch (psi) at sea level. Adjustments are required for elevation. Increase processing time for water bath canning and processing pressure for steam canning. Safe processing allows all the food in the jars to reach the required temperature and pressure. For extra safety, boil low acid foods for 10 minutes before serving. (See The Natural Canning Resource Book for more information.) The Ball Blue Book has an altitude adjustment chart, as would a new pressure canner. If someone still manages to get sick, get them to the hospital immediately. Do not attempt home treatment. They must get the botulism antitoxin. Do you have any other questions about botulism? Leave a comment below. Excellent article. Always good to learn some new facts and review what you already know! Thanks! Thank you, Joanne. There are a lot of questionable canning recipes out on the internet, or in old cookbooks, or passed down through families. If we known the basic science, we can evaluate any potential risks of these recipes. Actually, it is processing pressure that is adjusted for elevation. Above 1000′, you pressure can at 15 lbs pressure. Otherwise, good article. Canning can be done safely, but you have to follow the rules. Thanks for catching that. For water bath canning, times are increased, for steam canning, pressures are increased. I’ve clarified this in the article. This article has a serious error. Jars do not seal while in the pressure caner unless you wait until the caner cools with the jars inside. Normally, jars ping when they seal while cooling, not while being processed in the caner. That is the reason you don’t disturb the jars for 24 hours after caning. Yes, the section of the article you’re referring to is the story of a man who attempted to pressure can elk meat, but did not follow safe canning practices and nearly ended up dead. I made La Madeleine’s tomato basil soup from a recipe. I do not have a pressure canner. I put it in a canning bath for 20 minutes. Is this going to be okay. No ma’am. If the recipe I’m looking at is similar to the one you used, with a cup of cream and half a stick of butter, it would not be safe for water bath canning or pressure canning. Canning dairy products is a no-go. I would advise freezing it or freeze drying it instead.